I often see people refer to studies of German cycleways where the conclusion is that they’re dangerous, then claiming that these studies are evidence that all cycleways are therefore dangerous. There is this false notion of “northern European countries” or “continental Europe” being some homogenous mass, all of them covered with identical cycling infrastructure, which therefore means that a German study critical of German cycle infrastructure is therefore critical of the very concept of cycle infrastructure. But the truth is that there’s huge variation between these countries. The Netherlands leads by a country mile, Denmark a distant second, and everywhere else is a runner-up. The UK didn’t even enter the race. To use the phrase “northern European countries” with regards to good cycle infrastructure is to beat around the bush: you mean the Netherlands. Say “the Netherlands”. Sure, it’s not all perfect, but that’s where the best stuff is, by far, and in great quantities. So these people who quote studies of German cycling infrastructure are missing one major point: German cycleways are crap. So the studies merely prove that crap cycleways are crap. It’s certainly no smoking gun. 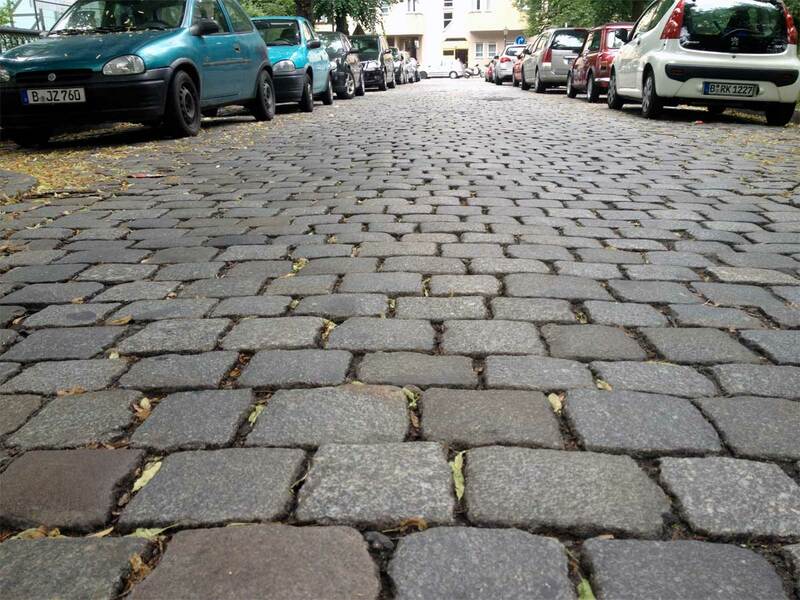 Quoting a study of German cycleways from today would be bad enough, but in the 1980s they were even worse, judging by some of the older stuff here in Berlin. To use that study to argue against good quality cycling infrastructure is like quoting the Hindenburg disaster to argue that travelling on an aeroplane is deadly. 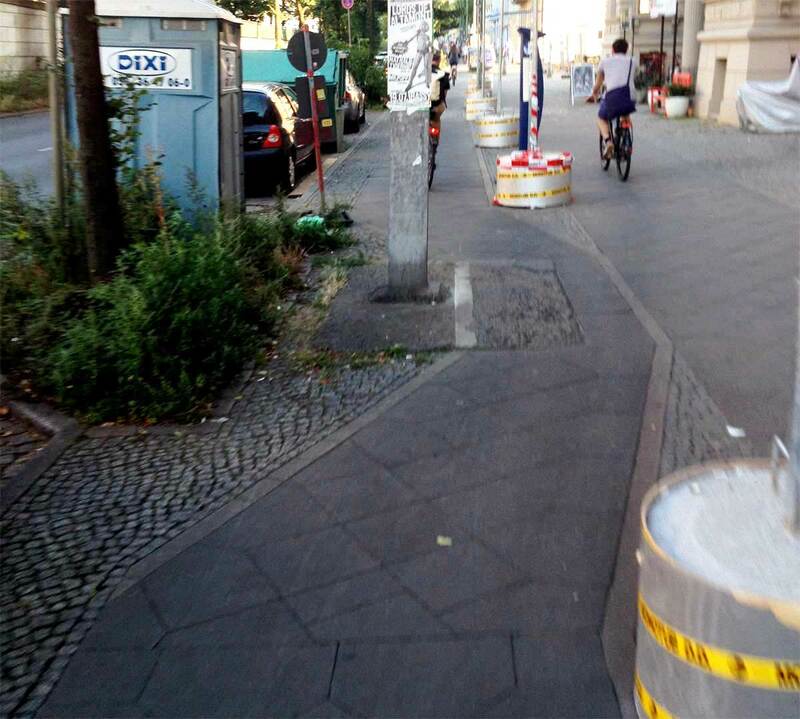 No modern cycling infrastructure advocate should be asking for what we have here in Berlin, or holding it up as a shining example. I don’t claim to have visited every German town and city, but I’ve been to a few. Some places are better than others, but in none of them has there been anything worth writing about. Even the most average Dutch town has far better infrastructure by comparison. 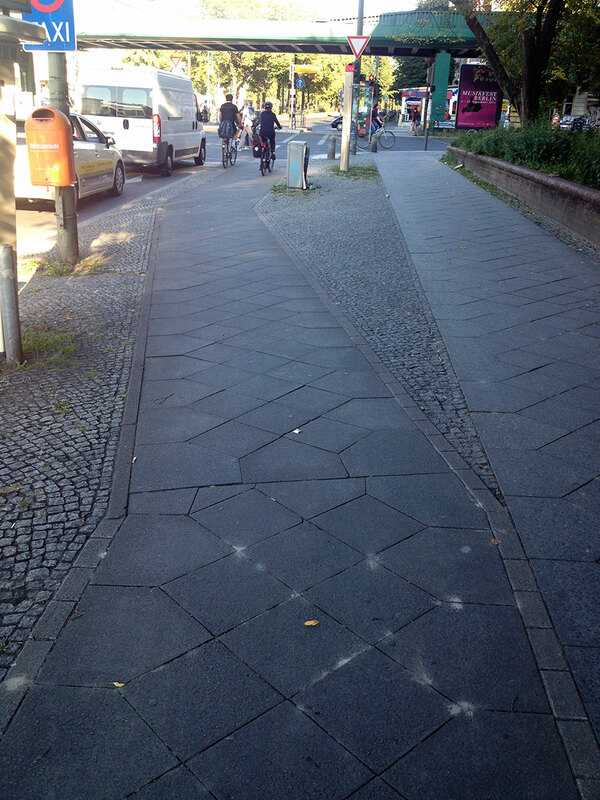 As I now spend my days in Berlin, let’s look at some Berlin cycleways, shall we? 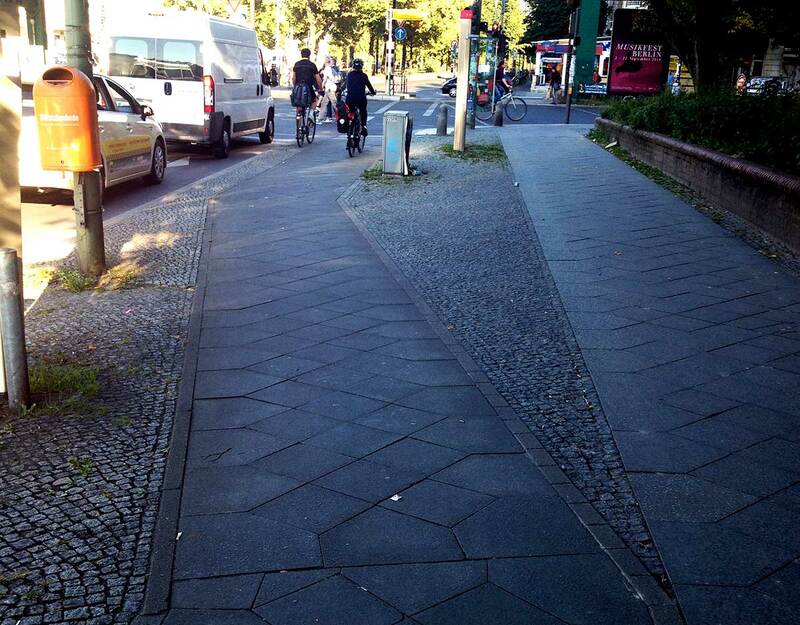 First of all, it’s important to remember that cycling infrastructure in Berlin is unreliable. There’s no network, just disjointed paths which you can never be sure aren’t about to suddenly end without warning. And often where there is a cycleway, it’s narrow, rutted or covered with foliage. 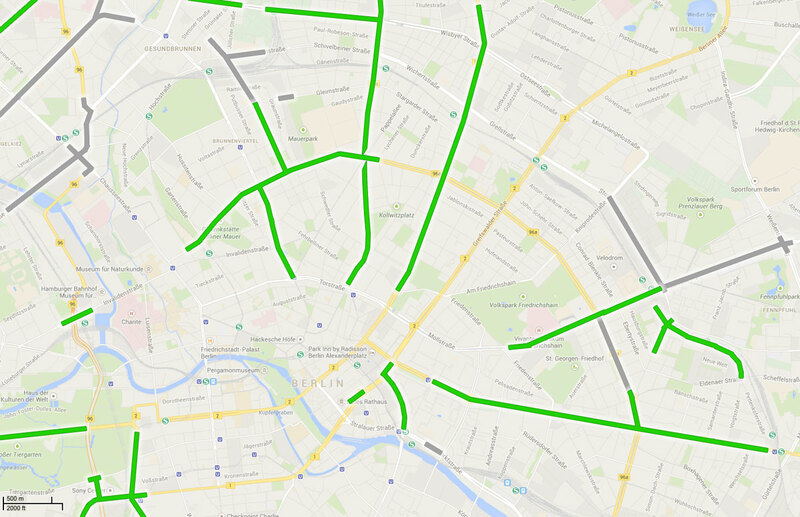 So the bits I’m covering here are the parts where reasonable cycleways actually exist, and not the majority of roads where there’s nothing (painted lanes don’t count). 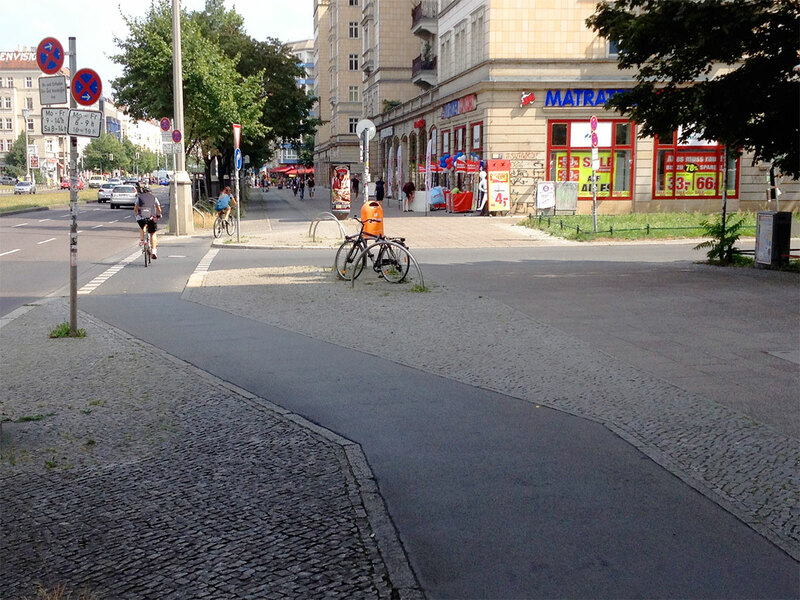 The biggest problem with Berlin’s cycleways is the major junctions. For some crazy reason, instead of keeping bicycles and motor vehicles separate at this most dangerous point, the standard design actually brings bikes towards motor vehicles! That’s right – the intentional design here leads people on bikes into the blind spot of motor vehicles that might be turning. That the cycleway might have been hidden by parked vehicles until just before the junction doesn’t help. And then, to top it off, the separation ends, usually just before the junction proper. So suddenly you’re cycling on the road, right alongside motor vehicles which may be turning across your path. The signal phases aren’t separated either, so turning motor vehicles and bikes going straight on get a green light at the same time. This isn’t necessarily a huge issue as drivers here are used to giving way to people walking and cycling when turning on green, but as the bike lane is now right up alongside the turning cars, as soon as the front car begins to turn, the cycle lane is blocked. This bizarrely crap design also means that the “free right turn” which is taken for granted in the Netherlands doesn’t exist here. This adds much time and effort into a journey by bike, as well as danger. It isn’t at all like the true protected intersection   or simultaneous green junction that bike infrastructure advocates want. 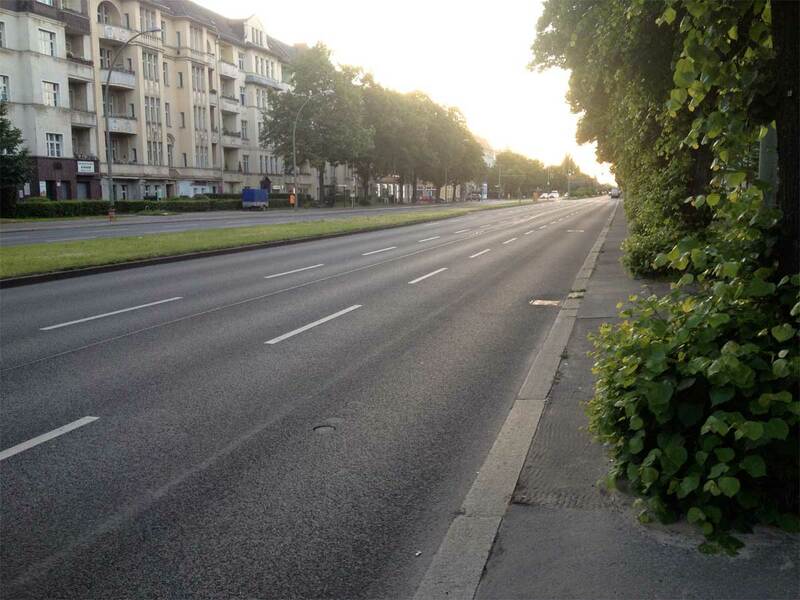 For example, here on Frankfurter Allee, rather than the cycleway continuing in a straight line or bending away from the main road at a junction, it bends towards the turning cars instead, guaranteeing poor visibility angles and reducing reaction time. Furthermore, the cycleway drops down to carriageway level, and is marked out only in paint. In essence, it becomes a painted cycle lane, offering no protection at all. The few dozen people driving into this car park have priority over the thousands of people riding and walking along here. Take a look for yourself here. 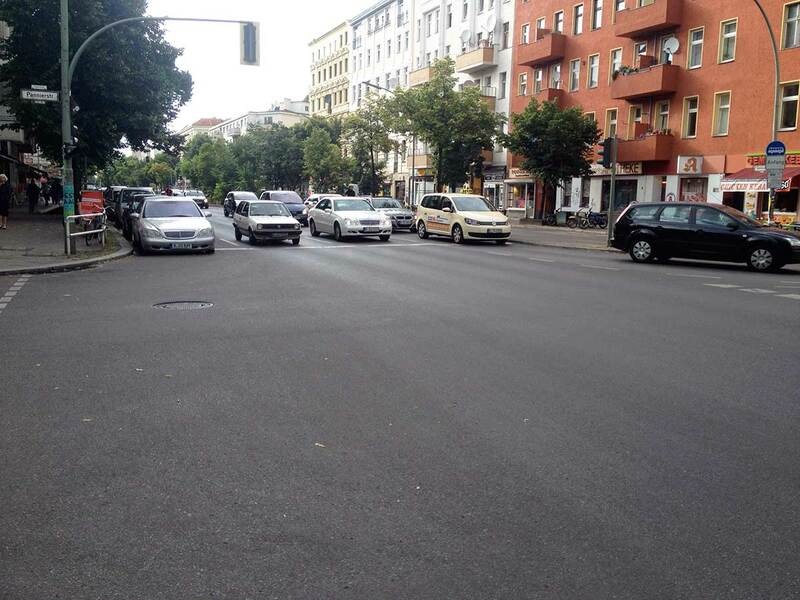 Another example, here on Schönhauser Allee, is better than above. But there’s still much wrong with it. The corner radius for turning cars is too large (it should be tight to slow down turning cars). The cycleway drops down to meet the road, there’s a visible kerb which confuses visual priority, and a bumpy change of surface on the cycleway from tiles to paint. I know this probably looks like a dream to all my UK and US readers, but please know that this isn’t good enough. Contrast those with the usual design for these roads in the Netherlands, where the cycleway continues at a raised level, and so does the footway – it’s the driving infrastructure which is disjointed, not walking and cycling. There’s little doubt who has right of way from this point of view. 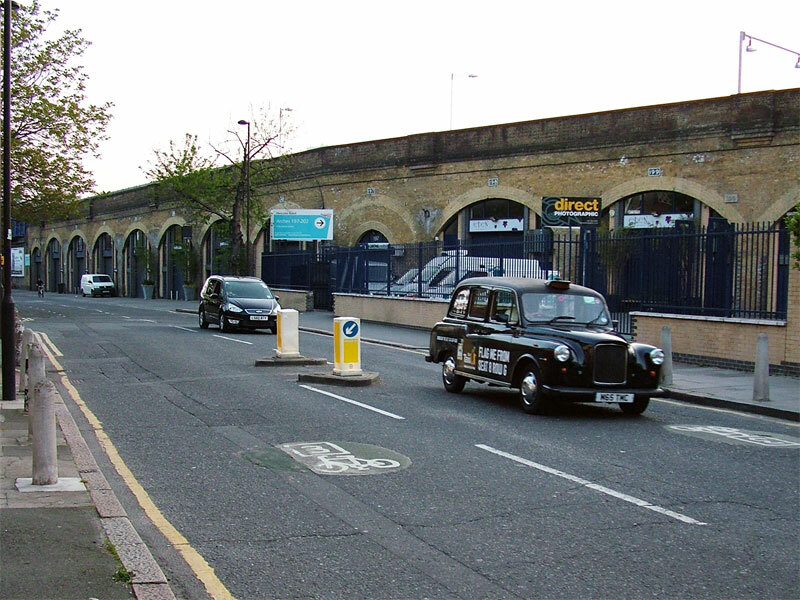 The white squares make riders aware that there’s a potential hazard at that section, and bollards prevent cars from leaving their allotted area. Here, turning motor vehicles must turn at a sharp angle and mount a sloped kerb, which ensures slow speeds, and cars cross the cycleway at 90º, giving good visibility. This also gives people on bikes to know that a car is turning long before any collision may occur, unlike the common German design where the bike path is right alongside the turning car, so there’s no time to react if the driver hasn’t seen you. 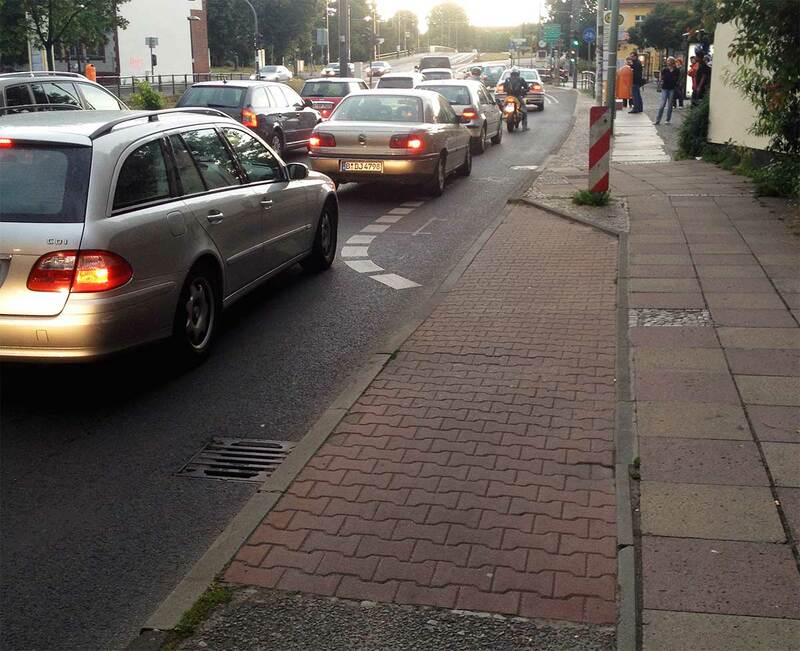 That many German cycle campaigns are anti-cycleway should tell you all you need to know: German cycleways are poor quality. But many of these campaigners, unfortunately, are campaigning for Germany to become more like the UK: i.e. painted lanes and battling for road-space with motor vehicles, and the 2% journey share that comes with it. The way to achieve more and safer cycling – as found in a tiny, low country just to the West – is to improve the quality and design of cycleways, not to get rid of them altogether. Quoting studies of poor-quality, outdated designs doesn’t disprove the very concept of separate cycleways, but instead reinforces the need for using the best designs. Anyone who quotes studies of German cycleways as proof that all cycle infrastructure is a bad idea, is either uninformed or abusing the truth in order to mislead.